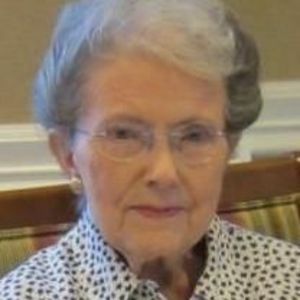 DAVIDSON-Lois M. Tomlinson, of Davidson, died Friday, June 30, 2017, at The Pines at Davidson, where she had made her home in recent years. She was born January 10, 1920, in Iredell County, and was the daughter of the late Fred Jasper and Elsie Plyler Murdock. She was also preceded in death by her husband, L. B. Tomlinson, Jr., a brother, Conda Murdock, and a sister, Phoebe Murdock Andrews. A graduate of Statesville High School, Lois was also a graduate of Mitchell College. She and L. B. were married February 21, 1948, and were longtime residents of Statesville with L. B. passing away in 1987. Lois was among the third generation of the Murdock family to be chair manufacturers in Iredell County. Her grandfather, Johnson Murdock, started by handcrafting chairs, and then her father, Fred Murdock, founded Builtright Chair Company in 1938. Lois was Secretary-Treasurer of Builtright as well as Office Manager and Sales Manager for 37 years. She and her brother, Conda, and others in their family continued this operation until it was sold in 1975. Lois was a member of Broad Street United Methodist Church, where she was a member of The Christian Forum Class. She served on the Board of Trustees and the Administrative Board for Broad Street UMC, and she also served on the Board of Trustees of Mitchell College. Lois was a member of Statesville Altrusa Club for 35 years. She moved to The Pines in December of 2005. Lois is survived by one sister, Vallie Murdock Sharpe, of Kettering, OH; a sister-in-law, Betty Jean Lazenby Murdock, of Statesville; special friend, J.D. Chamberlain, of Mooresville, NC; nieces Anna Murdock of High Point, NC, Laura Andrews Mitchell (Everette) of Dover, NH, and Emily Sharpe of Dayton, OH; as well as nephews Eric Murdock of Plymouth, NH, Steve Murdock of Birmingham, MI, David Sharpe (Cathy) of Dayton, OH, Douglas Andrews of Greensboro, NC, and Bryan Andrews (Kathryn) of Statesville. A private burial will take place at Oakwood cemetery where Lois will be laid to rest. A memorial service celebrating Lois' life will take place at Broad Street UMC at 2:00pm on Saturday, July 8th. Visitation and receiving of friends will follow the memorial service in the church fellowship hall. In lieu of flowers, memorial contributions may be made to: The Building Fund, Broad Street United Methodist Church, P.O. Box 169, Statesville, NC 28687. The family would like to express their very deepest gratitude to all the staff and caregivers of The Pines at Davidson, Dudley's Home Health Care, and Lake Norman Hospice for all the kindness and loving care given to Lois. You are all very special people to us. Bunch-Johnson Funeral Home is entrusted with the arrangements.